Give your wheels an upgrade with Genuine Toyota rims and wheel locks from Tuscaloosa Toyota in Alabama ‐ serving Birmingham, Columbus, and Jasper ‐ and enjoy improved performance and second glances. As one of the primary go-to vehicle enhancements, wheels are where drivers have the freedom to enhance with different finishes, sizes, and spoke designs, which is why our inventory of Genuine Toyota Alloy Wheels is stocked with hundreds of size and style options. Not only do our inventory selections offer improved aerodynamic feel while you drive, but they also tighten your vehicle's overall load, which increases overall mileage. 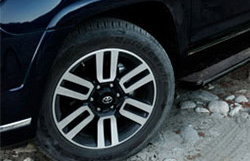 Safeguard your new Toyota wheels against potential theft with Toyota Alloy Wheel Locks. Along with ensuring your vehicle's safety, their triple nickel chrome plating creates a polished style and superior corrosion protection for continued visual appeal. 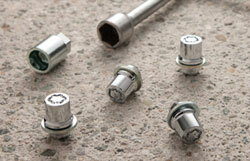 Each lock is machined with precision and weight-match to the stock lug nut so that rebalancing is unnecessary.